“Spring is a time of growth and renewal, have you made your own personal growth and renewal plans? Forum Theatre is a UNESCO-recognized educational tool for implementing social change and is a form of interactive theatre that enables a community to explore multiple strategies in response to a problem or conflict presented in a short play. 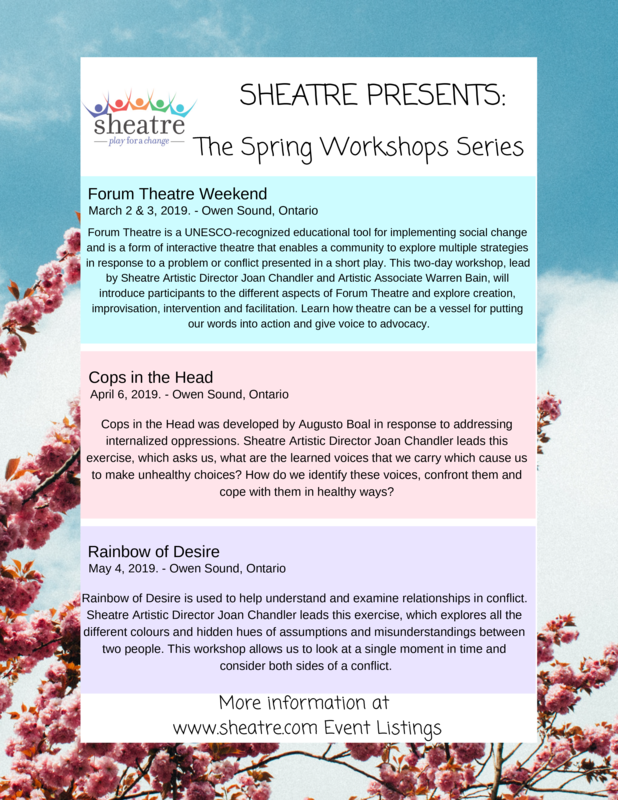 This two-day workshop, lead by Sheatre Artistic Director Joan Chandler and Artistic Associate Warren Bain, will introduce participants to the different aspects of Forum Theatre and explore creation, improvisation, intervention and facilitation. Learn how theatre can be a vessel for putting our words into action and give voice to advocacy. Attire: This is an interactive, participatory workshop. Dress for physical activity. Cost: $200, which includes the workshop and healthy lunch and snacks on both days. “Spirit of Africa is a fun, exciting, interactive workshop that uses dance movement, music, and song to tell the story of the African people. Participants will learn about how the everyday lives of African people transfers through the arts, where examples of their daily activities, values and customs are portrayed. This workshop consists of a series of movements and song and drum rhythms from different parts of West Africa, followed by a formal instruction of a traditional dance piece, and ending with a “cookup”, where participants are able to freely express themselves. Participants should dress comfortably, be prepared to dance barefoot, and ready to have fun! This workshop is part of Scarborough Arts’ SA Suite of Programs — 2019. “The Inkling Incubator is a Red Dress Productions (RDP) interdisciplinary research project that will convene a diverse working group of Deaf, disabled, hearing, and enabled artists for two five-day intensive, arts-based research workshops. 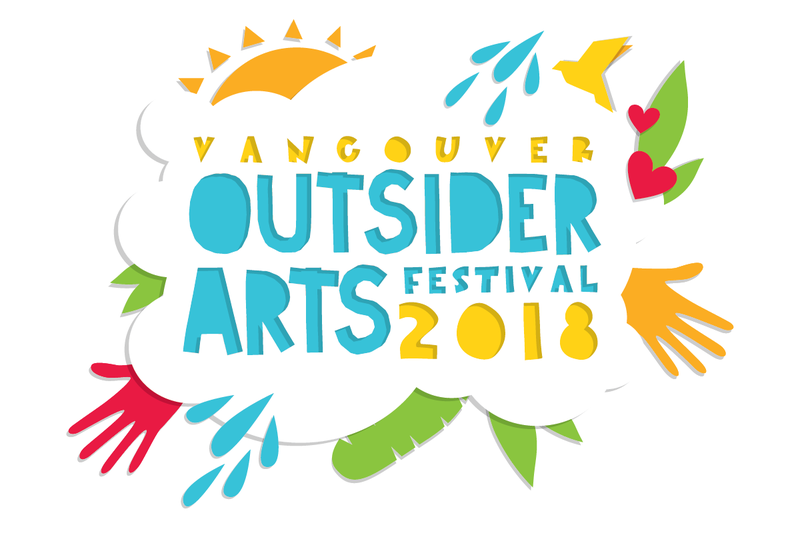 Community Arts Council of Vancouver presents the second annual Vancouver Outsider Arts Festival (VOAF) offering visual and performing artists facing social exclusion and other barriers opportunities for exhibition and sales, performance and participation, connection and learning. The 3-day free festival includes individual artists as well as organizational partners, workshops for artists and the public, and hundreds of artworks on display and for sale, alongside music, spoken word, live art, clown, and other performances in the Exhibition Hall. This year Vines Arts Festival and VOAF are co-presenting a performance series Friday on the outdoor Turntable, followed by a conversation around accessibility and Ablesim. Our primary values are inclusion and active participation towards strengthening a sense of community and creative citizenship among participants and the public. Eligible artists self-identified as outsiders and have strong creative practices, with wildly diverse aesthetics. 100% of sales go to artists, and performers are paid fees: this is a professional opportunity for outsider artists. The festival aims to increase awareness about Outsider Artists and to challenge stereotypes about who and what counts in the art world. The festival provides a much-needed platform for visual and performing artists to gather, learn, and share their creative scope with Vancouver. PLAN, MPA Society, Coast Mental Health, and Alternative Creation Studios are all organizing group shows, alongside 46 exhibiting individual artists. Free public learning workshops for artists include “The Business of Selling Your Art” on Saturday at 10 AM and “Writing Grants 101” on Sunday at 10 AM. 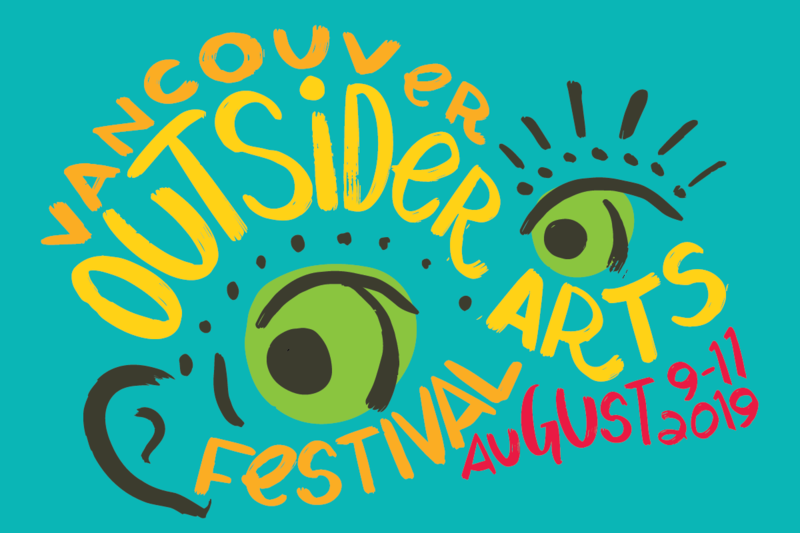 For more information, please visit CACV’s website and Vancouver Outsider Arts Festival’s event page. “Community members living in the East End will soon have the opportunity to engage with public art and develop artistic skills through a free, six-week program offered by Mural Routes in partnership with Community Centre 55. Introduction to Mural Art will be offered at this community centre (97 Main Street) on Thursday evenings from 5:30pm – 8:30pm, February 1st to March 8th, 2018. In line with Community Centre 55’s past programming around mural production and graffiti transformation for youth, this program will allow community members to build the necessary confidence to participate in public art projects in their communities. The program will be led by Mural Routes Lead Instructor Rob Matejka, an established community artist who has led mural projects and arts education programs across the city for over 15 years. Participants will learn foundational art, design, and mural-making skills. Classes will include topics such as drawing and painting techniques, colour theory, design challenges, stencil design and printing, enlarging techniques, and large-scale collaborative design. While the program focuses on mural techniques, participants will not be working on a wall mural but on large-scale panels. Introduction to Mural Art is open to people of all skill levels; past iterations of the program held across Toronto have brought together a range of participants, from new mural enthusiasts to emerging muralists. Instructors adjust the program to the interests and abilities of the students, and participants work together to develop skills, share ideas, and foster enthusiasm for public art. Introduction to Mural Art is offered entirely free of charge, including all materials and instruction. The program is offered three times per year as part of the Mural Art Learning Institute (MURALI), a Mural Routes initiative funded by a three-year, $565,100 Grow grant made in 2015 by the Ontario Trillium Foundation. Adaptable to diverse partnerships, contexts, interests and regions across Canada. Snacks and some meals provided. Accommodation: For out of town registrants, we can help you find free or affordable billets. Certification: Attendees will receive a certificate of completion from the Jumblies Studio. This workshop can also be adapted for other Ontario and Canadian locations. “Mixed Company Theatre, with the support of the Government of Ontario Senior Community Grant Program, is bringing our popular community-based workshops to seniors across the GTA this fall and winter.Facilitated by our Artistic Director, Simon Malbogat, our Elder Care Workshops seek to empower senior citizens and address the pressing issue of elder abuse in our communities. 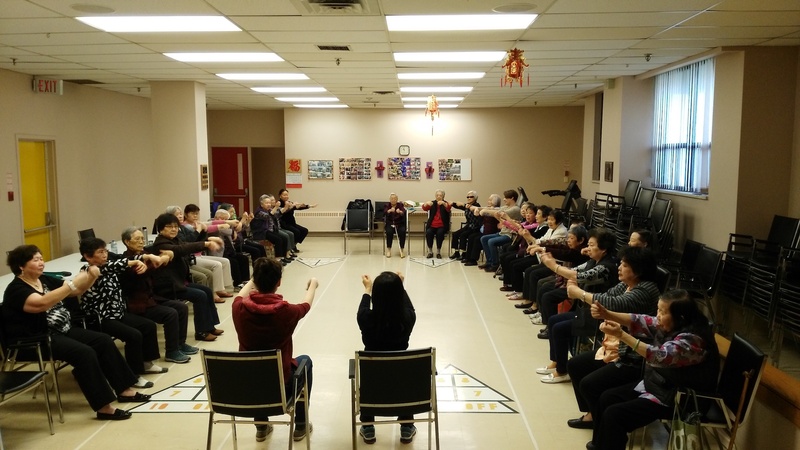 In these workshops, participants will be led through a series of exercises and activities developed from Theatre of the Oppressed/ Forum Theatre methodology that will provide seniors with the tools to express and address issues relating to elder care and abuse. The Elder Care program is also designed to address diverse groups of seniors, including newcomer/refugee groups. To bring our Elder Care workshops to your organization, please contact: info@mixedcompanytheatre.com.